Preheat oven to 400˚. Cut butternut squash into 1/2″ cubes and onion in to small chunks. Whisk olive oil, salt, and honey together, then toss with butternut squash and onions. Spread butternut squash on a baking tray and roast until tender and beginning to brown, 35-45 minutes. Take bread and cut into crouton-size cubes. Toss with olive oil, garlic powder, and salt. Place in oven and bake for 10-12 minutes or until cubes are crispy, remove and set aside. Place pecans in a small skillet over medium-low heat. Cook, while stirring frequently, until toasted- 5-7 minutes. 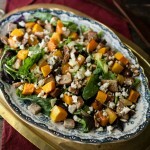 Toss together lettuce, toasted pecans, blue cheese, croutons, and butternut squash mixture. Serve with a drizzle of olive oil and good balsamic vinegar.